2018 - present: member of the Education group at RStudio; member of the Toronto Public Library's Innovation Council. 2017 - 2018: Head of Instructor Training at DataCamp; member of the Toronto Public Library's Innovation Council. 2017: Principal Consultant at Rangle.io focusing on technical training. 2015 - 2016: Director of Instructor Training for the Software Carpentry Foundation. 2014 - 2015: Executive Director of the Software Carpentry Foundation. Developed curriculum, trained instructors, negotiated partnerships with universities and other organizations, and led development of a web-based tool for tracking instructors and workshops; co-organized a summit meeting of free-range computing education groups in June 2015. 2012 - 2014: Project lead for Software Carpentry while employed by the Mozilla Foundation; co-edited Volume 2 of The Architecture of Open Source Applications. 2011: Software engineer, Side Effects Software Inc. 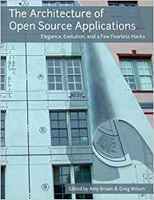 Helped design and build a web application for their flagship product; co-edited Volume 1 of The Architecture of Open Source Applications. 2010 - 2011: Project lead for Software Carpentry; co-edited Making Software; supervised MSc theses at the University of Toronto while an Adjunct Professor in the Department of Computer Science. 2006 - 2010: Assistant Professor in the Department of Computer Science at the University of Toronto. Taught graduate and undergraduate courses; developed a Professional Master's degree in Computer Science; co-edited Beautiful Code; on the editorial boards of Computing in Science and Engineering and Doctor Dobb's Journal; supervised Msc theses; published Bottle of Light (a children's book). 2004 - 2006: Wrote Data Crunching; rewrote the Software Carpentry course under a grant from the Python Software Foundation; Adjunct Professor in Computer Science at the University of Toronto; contributing editor with Doctor Dobb's Journal. 2000 - 2004: Helped develop an access control and authorization product at Baltimore Technologies and Hewlett-Packard; contributing editor with Doctor Dobb's Journal; developed a course on software design and supervised undergraduate honors projects at the University of Toronto. 1998 - 2000: Organized and ran Software Carpentry classes at Los Alamos National Laboratory; worked on an access control product for Nevex Software Technologies; editorial work for Doctor Dobb's Journal; published Three Sensible Adventures (a children's picture book). 1996 - 1998: Visible Decisions Inc., Toronto. Team lead for an IDE for building 3D data visualizations. 1995 - 1996: Centre for Advanced Studies, IBM Toronto. Co-developed a C++ library for parallel and distributed computing; co-edited Parallel Programming Using C++. 1992 - 1995: Post-doctoral work at the University of Oregon, University of Alberta, Australian National University, Vrije Universiteit (Amsterdam), and University of Toronto while writing Practical Parallel Programming. 1986 - 1992: Edinburgh Parallel Computing Centre. Developed and parallelized large scientific applications; created and ran the Centre's Summer Scholarship Programme; developed an entry for the 1989 World Computer Chess Championships while completing Ph.D. part-time. 1985: Design Interpretive Division, Bell-Northern Research, Ottawa. Developed a real-time interface to a 3D digitizer for use in an office automation system prototype. 1984 - 1985: Developed signal processing software for Miller Communications in Ottawa. 1975 - 1983: Various part-time and summer jobs, including an NSERC USRA in 1982. 1993: Ph.D. in Computer Science, University of Edinburgh. Thesis was Structuring and Supporting Programs on Parallel Computers. 1986: M.Sc. in Artificial Intelligence, University of Edinburgh. Thesis was An Implementation of a Connection Method Theorem Prover for S5 Modal Logic. Shared Howe Prize for best thesis in year. 1984: B.Sc. in Mathematics and Engineering (First Class Honours), Faculty of Applied Science, Queen's University, Ontario. Top student in graduating class. Winner of ComputerWorld Canada's "IT Educator of the Year" award, 2010. Co-winner with Andy Oram of 2008 Jolt Award for Best General Book (for Beautiful Code). University of Toronto Computer Science Student Union Teaching Award, 2004. Shared Howe Prize (best M.Sc. thesis in Artificial Intelligence), University of Edinburgh, 1986. University Medal, Queen's University, 1984 (top student in graduating class). Co-winner of A.B. Lillie Prize, 1984 (top student in Mathematics). Greg Wilson: Teaching Tech Together. Lulu.com, 2018. Amy Brown and Greg Wilson (eds. 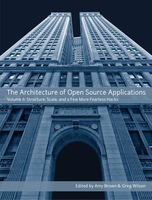 ): The Architecture of Open Source Applications (two volumes), Lulu.com, 2011 and 2012. Andy Oram and Greg Wilson (eds. 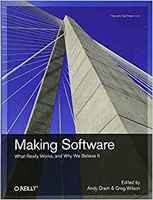 ): Making Software: What Really Works, and Why We Believe It. O'Reilly, 2010. Jennifer Campbell, Paul Gries, Jason Montojo, and Greg Wilson: Practical Programming. Pragmatic Bookshelf, 2009. Andy Oram and Greg Wilson (eds. 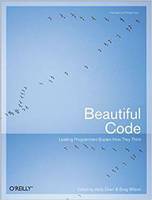 ): Beautiful Code: Leading Programmers Explain How They Think. O'Reilly & Associates, 2007; winner of 2008 Jolt Award for Best General Book. Greg Wilson: Data Crunching: Solve Everyday Problems Using Java, Python, and More. Pragmatic Bookshelf, 2005. Gregory V. Wilson and Paul Lu (eds. ): Parallel Programming Using C++. MIT Press, 1996. Gregory V. Wilson: Practical Parallel Programming<. MIT Press, 1995. Arthur Trew and Greg Wilson (eds. ): Past, Present, Parallel: A Survey of Available Parallel Computing Systems. Springer-Verlag, London, 1991. Neil Brown and Greg Wilson: "Ten Quick Tips for Teaching Programming". PLoS Computational Biology, 2018. Gabriel Devenyi, Rémi Emonet, Rayna Harris, Kate Hertweck, Damien Irving, Ian Milligan, and Greg Wilson: "Ten Simple Rules for Collaborative Lesson Development". PLoS Computational Biology, 2018. Daniel Almeida, Gail Murphy, Greg Wilson, and Mike Hoye: "Do Software Developers Understand Open Source Licenses?" ICSE'17, 2017. Morgan Taschuk and Greg Wilson: "Ten Simple Rules for Making Research Software More Robust". PLoS Computational Biology, 2017. Greg Wilson: "Software Carpentry: Lessons Learned". F1000 Research, 2016. John Blischak, Emily Davenport, and Greg Wilson: "A Quick Introduction to Version Control with Git and GitHub". PLoS Computational Biology, 2016. Marian Petre and Greg Wilson: "Code Review For and By Scientists". WSSSPE'14, 2014. Greg Wilson, Dhavide Aruliah, Titus Brown, Neil Chue Hong, Matt Davis, Richard Guy, Steven Haddock, Kathryn Huff, Ian Mitchell, Mark Plumbley, Ben Waugh, Ethan White, and Paul Wilson: "Best Practices for Scientific Computing". PLoS Biology, 2014. Eleni Stroulia, Ken Bauer, Michelle Craig, Karen Reid, and Greg Wilson: "Teaching Distributed Software Engineering with UCOSP: The Undergraduate Capstone Open-Source Project". CTGDSD'11, 2011. Jordi Cabot and Greg Wilson: "Tools for Teams: A Survey of Web-Based Software Project Portals". Doctor Dobb's Journal, 2009. Greg Wilson: "How Do Scientists Really Use Computers?" American Scientist, 2009. Jo Erskine Hannay, Hans Petter Langtangen, Carolyn MacLeod, Dietmar Pfahl, Janice Singer, and Greg Wilson: "How Do Scientists Develop and Use Scientific Software?" SECSE'09, 2009. David Matthews, Greg Wilson, and Steve Easterbrook: "Configuration Management for Large-Scale Scientific Computing at the UK Met Office". Computing in Science and Engineering, 2008. Debbie Winter, Ben Vinegar, Hardeep Nahal, Ron Ammar, Greg Wilson, and Nicholas Provart: "An 'Electronic Fluorescent Pictograph' Browser for Exploring and Analyzing Large-Scale Biological Data Sets". PLoS ONE, 2007. Jorge Aranda, Steve Easterbrook, and Greg Wilson: "Requirements in the Wild: How Small Companies Do It". RE'07, 2017. Greg Wilson: "Where's the Real Bottleneck in Scientific Computing?" American Scientist, 2006. Greg Wilson: "Extensible Programming for the 21st Century". ACM Queue, 2004. Michelle Levesque and Greg Wilson: "Open Source, Cold Shoulder". Software Development, 2004. Sole or joint author of over 130 other articles and book reviews in academic journals, popular science magazines, newspapers, and trade publications, including Doctor Dobb's Journal, IEEE Software, New Scientist, and The Independent. Ellen Hsiang and Greg Wilson: And Then... Lulu.com, 2011. Greg Wilson: "Still" On Spec, 22/2, Summer 2010. Greg Wilson: Bottle of Light. Scholastic Press Canada, 2008. Greg Wilson: "Controlled Release" On Spec, 19/4, Winter 2007. Greg Wilson: "...But With a Whimper" On Spec, 19/3, Fall 2007. 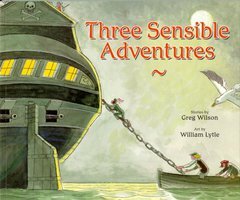 Greg Wilson: Three Sensible Adventures. Annick Press, 1999. Member, Python Software Foundation, 2010-present. Mentor for Google's Summer of Code, 2005-2015. Supervised or co-supervised over 100 undergraduate theses at several universities. Ultimate frisbee, 1991-2003 (Toronto "C" Division championship team 2002). Competitor in 6th World Computer Chess Championship, Edmonton, 1989. PADI Open Water Diver certification, 1998. Past or current member/volunteer with the Canadian National Institute for the Blind, the Sierra Club, Amnesty International, OXFAM, the Bruce Trail Association, and the Green Party of Canada.